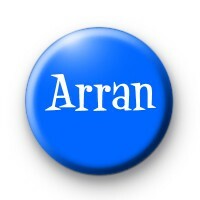 Blue button badges with white text on, perfect to create your own name badges. Simply enter the name you want on the badges in the box below and then click add to cart. Do this as many times as you like to create as many custom name badges as you need. The perfect way to personalise name badges for parties & weddings. Standard 25mm button badge hand made in our UK workshop.